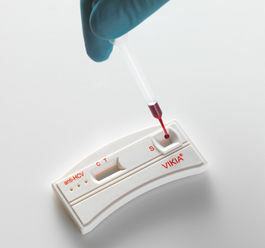 VIKIA® anti-HCV is a rapid test used for screening and as an aid in the diagnosis of Hepatitis C infections. Viral hepatitis caused 1.34 million deaths worldwide in 2015 according to the WHO, a burden comparable to tuberculosis and higher than HIV1. Globally, approximatively 399 000 people die each year from HCV (Hepatitis C Virus)-related complications, including cirrhosis, hepatocellular carcinoma1. In most cases, acute hepatitis C infection is completely asymptomatic; then, most newly infected people are unaware of their infection. Of the 71 million persons living with HCV infection globally in 2015, only 20% knew their diagnosis1, a figure that is estimated to drop below 5% some countries2. As a result, patients frequently present with already advanced disease at time of diagnosis. 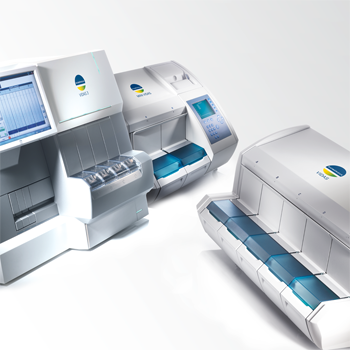 Increasing access to efficient diagnostics is one of the key steps towards reducing incidence and mortality of hepatitis C.
VIKIA® anti-HCV is a rapid immunochromatographic test for the qualitative detection of IgG antibodies to the 6 major genotypes of hepatitis C virus in whole blood, serum or plasma. It can be easily performed by health-care professionals in near-patient settings, or if limited laboratory resources are available, thus facilitating screening and linkage to treatment. 1. World Health Organization. Global hepatitis report, 2017. 2. World Health Organization. WHO Guidelines on hepatitis B and C testing, 2017. 3. Lewis L. , et al. Performance Evaluation of VIKIA® anti-HCV, Rapid Test for the Qualitative Detection of Antibodies anti-HCV in European and non-European Populations. Poster presented at Journée Nationale de la SAMIC, Alger, November 2017.
WHO Guidelines on hepatitis B and C testing | 2017. Centers for Disease Control and Prevention (CDC). Testing for HCV infection: an update of guidance for clinicians and laboratorians. MMWR Morb Mortal Wkly Rep 2013 10;62(18):362-5. European Association for the Study of the Liver, EASL Recommendations on Treatment of Hepatitis C 2016, Journal of Hepatology, Volume 66, Issue 1, January 2017, Pages 153-194, ISSN 0168-8278. French Health authority (Haute Autorité de Santé). [Place des tests rapides d’orientation diagnostique (TROD) dans la stratégie de dépistage de l’hépatite C] – May 2014. Centers for Disease Control and Prevention (CDC) Testing for HCV Infection: An Update of Guidance for Clinicians and Laboratorians – MMWR 2013 10;62(18):362-5. American Association for the study of Liver Diseases (AASLD) and Infectious Diseases Society of America (IDSA), HCV Guidance: Recommendations for Testing, Managing, and Treating Hepatitis C – September 21, 2017.
WHO. Global health sector strategy on viral hepatitis 2016–2021, toward ending viral hepatitis, June 2016.